I am a Cancerian and some would say I have typical cancerian properties – crabby just like the sign says, quick to retreat into my shell, have trouble sharing innermost secrets, shy etc. Some sources claim, however, that it is the least clear cut of all the signs of the zodiac. It is said that we can be untidy, sulky and devious, as well as loyal and easily flattered. 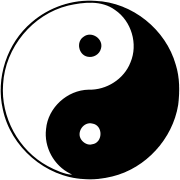 In researching what a Cancerian is truly like I have found that the best description is perhaps that we are full of contradictions, and maybe that explains the similarity of the cancer sign [above right] to that of the Chinese symbol of Yin and Yang [above middle]. 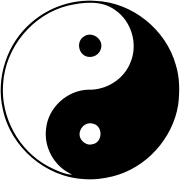 That symbol represents the balance in the universe between the masculine and feminine, the passive and aggressive, the warm and the cold. The theory states that all phenomena consist of two opposite affects, and the contradictions evident in the cancerian character are perhaps a true refelction of this. Do I beleive in Astrology? I would have said no once, and I still find it a little hard to grasp that the position of stars in the sky at the exact time of my birth had an impact upon my character. It’s also a bit of a stretch in reading a daily horoscope in a newspaper that it could apply to one twelfth of the world’s population. But there is always something in the way these things are written that can be applied to some particular aspect of our life at the time. Perhaps, where we read them and actually see some message we are simply enabling ourselves to view an event, or a state of mind in a way we may not have had we not read the prognostication. Those who are regular readers will know that I have considered myself to be a loner for most of my life, that I have certainly hidden many things from people, including from myself, that I am sometimes contradictory and maybe not as open as I would like to be. And it seems in reading other peoples blogs that there does appear to be an attraction of like minded people occurring – those with angst, or a degree of confusion, those who are looking for direction or who are seekers of self knowledge seem to visit here as I visit them. I wrote about that concept of friendship in the blogosphere a few weeks ago and the theme was taken up by a number of you. Follow-up posts Best Friends and Loners, For Sale Friend… , Midlife Friendship Questions, and Friendship, all link to the responses to that first set of questions. Recently Josie has also written about it in a post on her blog Picking up Pieces. Somehow we seem to have found a community here and I have wondered whether there are an inordinate number of Cancerians amongst you, or indeed if there is any coincidental number of any particular star sign amongst the readers. So I ask – what is your star sign?